A male grooming barber-shop inspired brand with formulas refined and tested by barbering legend Ken Paves and Figaro’s Barbershop (Lisboa), and co-created by David Beckham – what’s not to like about House 99? The brand, crafted by England’s favourite footballing son, is packed full of energising properties to boost your hair and beard, while smoothing and illuminating your skin, with the company employing key ingredients like Spirulina and Quinoa, two nutrient dense superfoods. 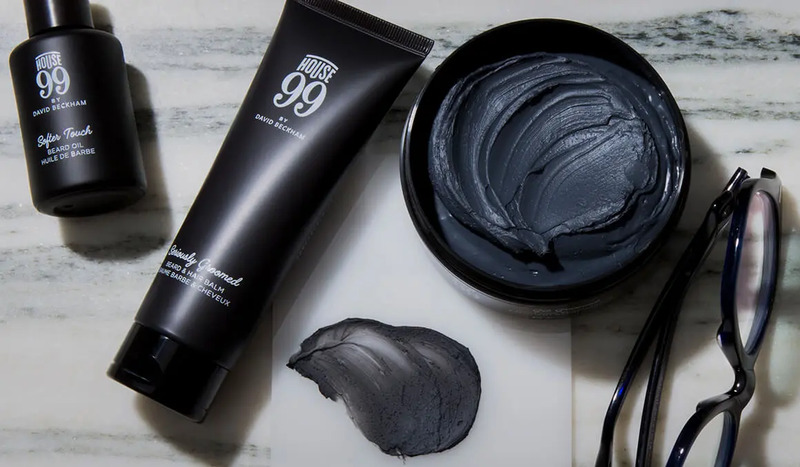 And to round it all off, as you’d perhaps expect from one of the best-dressed men on the planet, the House 99 packaging is slick and modern, making it a handsome addition to any bathroom shelf. David tells us that the brand is more about how you feel, not just how you look. It’s about feeling comfortable from within; a lifestyle choice. How you choose to wear your beard or hair is completely personal to you – House 99 purely exists to help facilitate your individual goals. The brand name stems from the year 1999 – the year when David got married, Manchester United won a historic treble, and his eldest son, Brooklyn, was born. So it has close personal ties to Beckham himself, tying in with the underlying philosophy. After both the ethos and branding was finalised came the hard part: delivering on its promise. Months of testing formulas in both labs and with barbers followed, with the label experimenting with ingredients, fine-tuning the packaging, and defining the product names. No stone was left unturned, and the proof is in the efficacy of the products – they really deliver. A barber-shop inspired brand with formulas refined and tested by barbering legend Ken Paves and Figaro’s Barbershop (Lisboa). Packed full of energising properties to boost your hair and beard, while smoothing and illuminating your skin, with the company employing key ingredients like Spirulina and Quinoa, two nutrient dense superfoods. A handsome addition to any bathroom shelf. David Beckham uses the brand. Delivering a medium hold with a natural-looking finish, this is a classic pomade which is suitable for shaping everything from a soft quiff to sleek pompadour. The former being David’s iconic hairstyle, which he’s never revealed how he achieved the style, until now. Enriched with Spirulina and Quinoa extracts, we found it delivered the perfect amount of hold while leaving hair with a natural, healthy appearance. The Softer Touch beard oil is an essential purchase for any bearded gentleman. Tested and approved by barbers, this sleek, non-greasy formula will keep your facial hair exceptionally soft thanks to the addition of enriching and nourishing shea oil. And if you ever decide you’ve had enough of the bearded life, it can also be used as a pre-shave oil. And perhaps best of all, the formula is designed to avoid greasy residue on your hands after use, so you can use phone straight away for instance – definitely a first in this category, and a welcome addition. What is a perfectly shaped beard, slick haircut or stylish tattoo without great skin? Fear not, for House 99 also boasts a particularly good face moisturiser in its male grooming arsenal. Designed with David’s hectic lifestyle in mind, the moisturiser has been developed specifically for men’s skin and ensures day-long hydration and an enhanced, radiant look. Additionally and crucially for men’s skin, the formula is also anti-shine and mattifying – meaning no more shiny face – and we found Greater Look kept any oily shine at bay all day. We found the texture to be perfect; lightweight but hydrating, great for sensitive shaved skin and its pollution-particle protection technology ideal for using around any busy city. For those of you with an unruly beard or hair, this balm will be a life-saver. Creamy in texture, it will even out, add structure and leave facial hair feeling nourished and conditioned. Beyond your face, you can also use it as a pre-styler for short-to-medium hair – giving it a healthy, softening boost and thicker appearance. Ape’s House 99 hero product selection wouldn’t be complete without a tattoo care product. Inspired by David’s 40+ tattoos (yes, 40) Bold Statement is designed to moisturise and hydrate tattooed skin for up to 24 hours. It will also help revive tattoo colour and maintain tattoo boldness while protecting your skin from the harsh effects of UV rays. We really enjoyed the spray delivery mechanism, making it easy to apply. The fast-absorbing formula means you can dress immediately after use. As you might expect, David Beckham’s input combined with L’Oreal’s production experience makes House 99 a winner. A collection of male grooming products designed for any modern gentleman’s lifestyle, and a stylish brand centred around a healthy (physical and mental) lifestyle. But – more importantly – the products truly work. It’s all about changing your look for the better, self-improving, a better lifestyle and a superior grooming appearance. We found the price point to be particularly palatable for the quality within – a mid-range price point, but with excellent results. House 99 really is ticking all the boxes. Visit house99.co.uk for more information and to buy. Spend £35 or more and receive Smooth Back + Greater Look and Truly Brighter minis worth £27 using code APEEXCLUSIVE. A paid partnership with House 99 – words and opinion Ape’s own.